← Making Scarves: How To’s and Tips! IT’S GETTING HOT…and yes, we’re still accepting cool-ties in 2017! No doubt about it: It’s already heating up again in Afghanistan, Kuwait, and Africa — and in other places where our troops are hard at work! Although we encourage year-round knitting of winter scarves and hats, those items won’t be sent to our troops until this Fall. 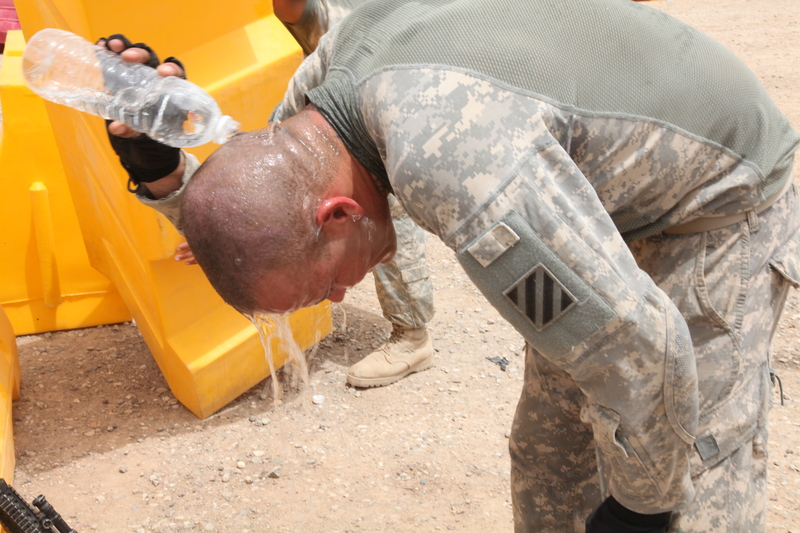 Right now our focus is on trying to help keep service members cooler as the triple-digit temps begin to hit. We would like to put a “cool-tie” into every care package, and yes — we’d love your help with this on-going program. WHAT IS A COOL-TIE? So glad you asked! Sometimes they are call ed bandana cool-ties because they are made out of similar material and are meant to be tied around the neck much like a bandana might be…They are filled with water-absorbent polymers and work on the principal of evaporative cooling. And unlike the water bottle used in the photo at right, cool-ties are a hands-free way to bring down your body temperature. COOL-TIE DIRECTIONS This can be a fun and worthwhile project for groups to do together — the work goes much faster with a team or a partner. We have directions you can print out here: Beat the Heat! Make a Cool-Tie! Cut strips of fabric about 6 1/2 inches wide, with the length measurement being the width from selvage to selvage. Please use tan, brown, desert camouflage or other neutral-colored cotton. No American flag fabric please. Sew a small width end, then turn 90 degrees and sew along the whole length side (1/4 inch margin), leaving the last short width end open. Turn it inside out and iron the creases. Sew (about 13 inches) up from the closed end, across the thin width. Add in the crystals. IMPORTANT: Be sure the crystals slide all the way down to the seam. Sew across the thin width again to make a pocket for the crystals. Close the final open thin width end, by tucking in the edges and sewing across. 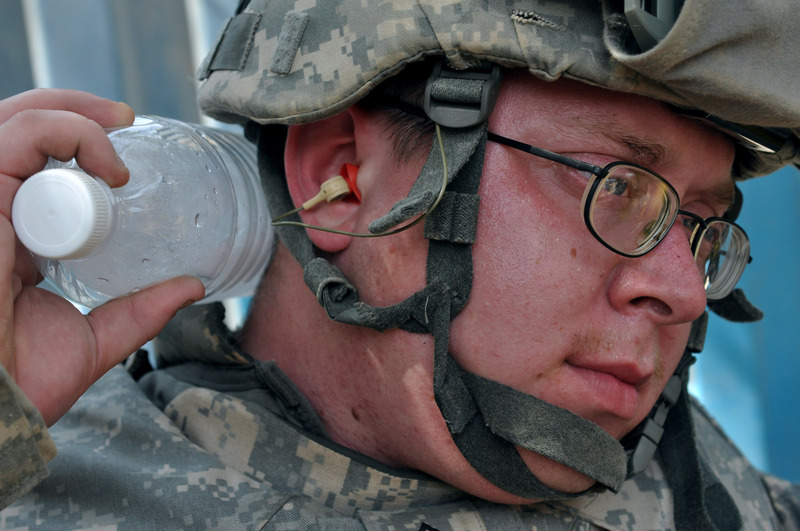 …THANKS for helping keep the troops COOL! Not sure you want to make cool-ties, but want to help in other ways? Check out our website for more ways you can express your thanks! As always, THANK YOU so very much for your support! This entry was posted in Uncategorized and tagged bandana cool-ties, care packages, community service, cool-tie pattern, cool-ties, crafts, donate, handmade, Middle East summer, Military care packages, Military support, non-profit organization, Operation GRatitude, polymer beads, sew, troops. Bookmark the permalink. This is a wonderful idea!! The problem, and it’s a major one, is that the polymer beads are entering our oceans/lakes/streams all over the world, and the ocean’s load of these micro and poly (plastic) beads is greatly increasing, choking numerous forms of ocean life. I know these are a god-send to each veteran that receives one in the unthinkable heat they must endure. Although I don’t know of a good alternative at this moment, I’m sure there is one. I very much hope you will consider making finding an alternative a priority so that the world these brave men and women are fighting for will be a bright, varied, and healthy one for everyone! Thanks for letting me put my two cents in, and please consider the possibility that there is another way to achieve the goal of cool-ties! !